We are pleased to announce Crest Auto World has come on board as a major sponsor of this year’s 42nd Annual Red Parka Pub Challenge Cup. Other new sponsors include Gosling’s Rum and Sport Thoma Ski Shop. This has been a very exciting planning season for this year’s race, taking place on Friday, March 20, at Attitash Mountain Resort. Two weeks ago, the Red Parka Pub Challenge Cup Committee pledged $500 to Starting Point: Services for Victims of Domestic & Sexual Violence and $10 of each female racers registration fee to the non-profit’s Project Purple Ribbon. In addition, we’ll name a male and female Red Parka Pub Challenge Cup Champion with official Silver Bowl for each champion and a Perpetual Trophy for each. Ladies and gentlemen, you will not want to miss this year’s event, get registered today! The Red Parka Pub Challenge Cup Committee met on Monday, February 9, and made the decision to donate $500 of this year’s funds raised from the Red Parka Pub Challenge Cup race to Starting Point Services for Victims of Domestic & Sexual Violence. In addition, $10 from every female registered racers fee will go to the cause. Fittingly, the Committee agreed that this year’s race hats–which all registered racers and race crew members receive–will be purple, which is the symbolic color for domestic violence awareness. Registration is now open to all male and female ski racers, age 21+. 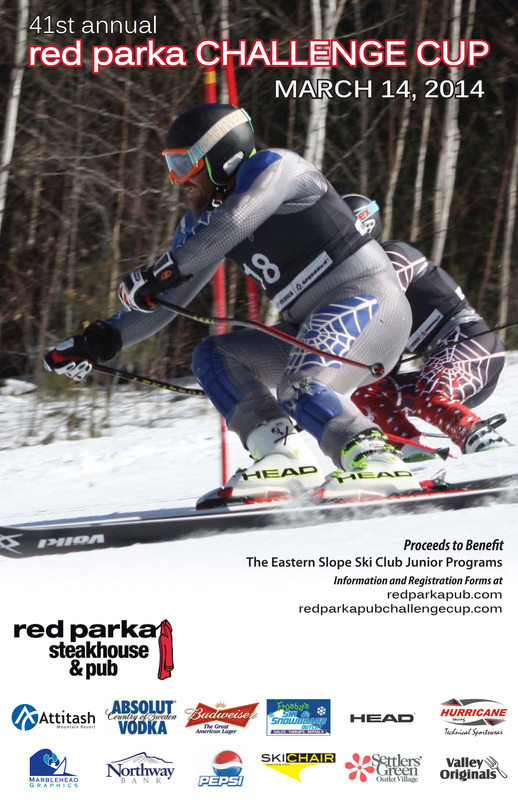 The 42nd Annual Red Parka Pub Challenge Cup Race takes place at Attitash Mountain Resort on Friday, March 20. Registration for the 2015 RPPCC Is Open! Registration for the 2015 Red Parka Pub Challenge Cup is now open! Now in its 42nd year, the RPPCC is the longest-running, pro-style dual giant slalom race in the United States. The past two year’s of racing have been dominated by local siblings, Alec and Ace Tarberry. Alec will be defending the title while Ace, who took the crown in 2013, should be close behind him as we head into the 2015 Challenge Cup, which takes place at Attitash Mountain Resort on March 20. This year, we’re happy to have Goslings Rum, Heads Skis and Sport Thoma as major sponsors of the race. We are also proud to have Budweiser, Settlers’ Green Outlet Village, Valley Originals, SkiChair.com, Pepsi and Hurricane Racing continuing as major sponsors of this race. Both men and women are welcome to compete. This is a 21+ race. If you are interested in becoming a sponsor or donating an auction item, please contact us. 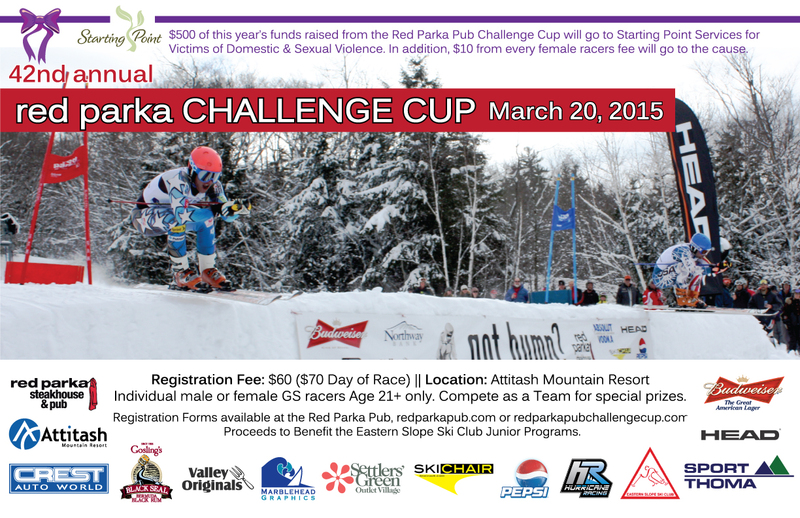 All proceeds from the Red Parka Pub Challenge Cup benefit the Eastern Slope Ski Club. Last year’s race raised $8000 for the club, which provides ski equipment and helps in ski development programs in the Mt. Washington Valley, located in the White Mountains Region of New Hampshire. 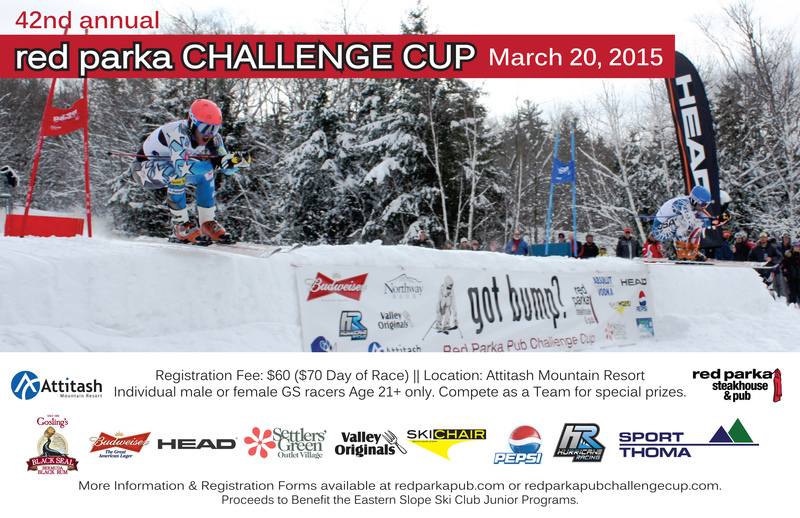 Save the date, we are hosting the 42nd Annual Red Parka Pub Challenge Cup on March 20, 2015 at Attitash Mountain Resort. We’ll be doing the official Bib Draw for the 41st Annual Red Parka Pub Challenge Cup on Thursday, March 13 at 7 p.m. at the Red Parka Pub. Bib #1 and #2 will be raffled off, with all proceeds going to the Eastern Slope Ski Club. We’ll also be raffling off tons of prizes throughout the evening. Tickets are $10 for an arms length. If you are a racer or not, join us in the pub as we celebrate on the eve of this year’s Red Parka Pub Challenge Cup Race, which takes place at Attitash on Friday, March 14. Prizes and gift certificates from our sponsors Absolut Vodka, Frosty’s Ski & Snowboard, Skichair.com, Valley Originals and much more.